At the end of Christmas comes the season of Epiphany, which begins on January 6. Epiphany means “appearing” or “manifestation.” In this season, we celebrate the ways King Jesus the Messiah has been revealed in the world. We remember especially a star, a baptism and some mighty fine wine. A star. Wise men came from the east, following a rising star and in search of the newly born King of the Jews, that they might worship him. Herod had no idea that such a birth had occurred and was incensed when he learned of it. But the wise men, who were pagans — that is, Gentiles, who had no covenant with the God of Israel — came and found Jesus the Messiah and honored him with rich gifts, revealing him in his majesty. A baptism. John the Baptist was sent by God to reveal Messiah to Israel. He announced that the kingdom of God was at hand and preached a baptism of repentance, preparing the way of the Lord. Jesus came to be baptized by him, an act that identified Jesus with his repentant people as well as with the purpose of God. Coming out of the water, the Holy Spirit descended like a dove and rested upon him, and the voice of the Father announced, “This is My beloved Son, in whom I am well pleased,” revealing Jesus as Messiah — the Son whom God anointed as King over Israel and the nations. Some mighty fine wine. 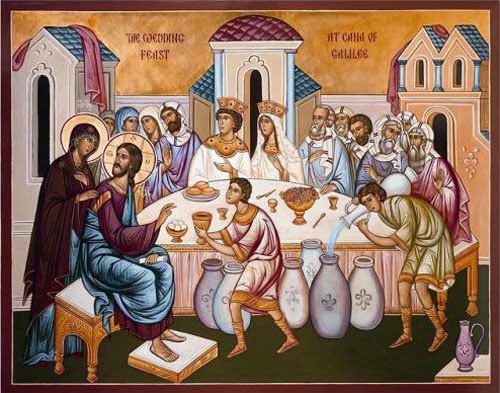 When the wine ran out at a wedding feast Jesus and his disciples were attending, his mother came for him to do something about it. “Why do you involve me?” Jesus said, “My hour has not yet come.” Yet Mary, his mother, turned to the servants and told them to do whatever Jesus said. Jesus had them fill large stone water jars with water, then he told them to take some of it to the master of the banquet. The master tasted it and commended the bridegroom for saving the best wine for last. The water that became wine revealed Jesus in his divine glory. We remember these things as we enter into the season of Epiphany, but we also watch for the ways Jesus is revealing himself in the world and making his kingdom known today. How is Jesus working in your life? How does he desire to work through your life? What would you like him to do in your life and in the world? Do whatever he tells you.